Well well well…… it has been a 5 month hiatus from putting my thoughts into words pertaining to literary pieces that I’ve engrossed myself in. Within that time period there was immense academic writing & reading, words of reflection put together via paper and pen from my private practice, along with a sprinkle of poetry. In fact some of the best poems that I’ve written to date came out of my disengagement from leisurely reading books during this time period. Psychoanalytic articles and PhD research interest papers overtook most of my creative writing and free time. 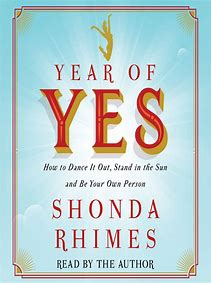 However, I am drawn towards summarizing my thoughts on the last book I read in 2018, gifted to me on my birthday: Year of Yes by Shonda Rhimes. Ms. Shonda Rhimes. The respect is there, it’s present and acknowledged in a similar fashion that I respect and acknowledge the accomplishments of several female entrepreneurs of color who are inspiring future generations of leaders. To be a woman - to be successful - to be a person of color, what does all of that mean in the context of our political climate in the Donald Trump era? How can you not like someone like her? She created the show that I had 2 or 3 seasons of enjoying during my undergrad years, “Grey’s Anatomy”, and one of the few shows that I currently watch: “How to Get Away With Murder”. She’s so likable, yet after reading her book I felt sure of myself concerning the fact that I don’t particularly care for her or her writing. Let me jump into the book to provide further insight. The concept is tantalizing, being intentional about saying yes for a year in various areas of life especially towards yourself. Yes to feeling comfortable in your body, yes to feeling confident in saying no, yes to taking risks and stepping outside of your comfort zone, yes to setting healthy boundaries. Blah blah blah. That’s what it read as throughout the book, blah blah blah. Shonda even threw in very real anecdotes in which she did not say yes to herself before so eloquently laying track so that the reader could easily get from point A to point B concerning what it looks like when you do say yes to yourself. I want to add that I have difficulty reading surface level writing as I also have difficulty with memoirs that lack intimacy and vulnerability. In fact, that’s an area of growth for me, engaging with books and people who lack depth (insert Scorpio Moon here). I read the book to get to know her, allowing in the time and attention towards taking her words in, and [tried to] fantastically experience all that she was sharing. It left a lot to my imagination. It was frothy and read as a self help amalgamation. The track she laid lacked any real personal meaning; the track laying was used often throughout the book in reference to her process concerning how she creates. It works when you have someone like Kerry Washington, Viola Davis or Patrick Dempsey breathing life into the work. There were no actors in the book that usually accompany Shonda’s track laying. Within the literary work Shonda acknowledged her aversion of intimacy, the comfort in privacy and essentially apologized to the reader for not going deeper. It’s to be appreciated, I guess. I have found a diminished lack of patience towards pieces of writing that are regurgitated information and masked as being innovative. I don’t believe that works for my generation, filled with individuals who are starved of genuine emotional bonds and overstimulated with information. We sniff out inauthenticity like a bloodhound sniffs out its prey. I tend to veer towards generosity with my language when describing the work from people of color who are easy to look up to, but perhaps 2019 will be a year of brutally honest critique towards all who consume my time and attention…… a bit of an exaggeration but you get the drift. I can not say I would recommend this book to anyone looking to know more of the woman behind the hit shows that grab the attention of viewers every Thursday night. I’d like to add that her TED Talk was from a chapter in her book, verbatim! I’ll continue watching HTGAWM but I highly doubt I’ll read another book from her. What I am hoping readers can absorb from my take on this nonfiction literary piece is to take information from self help books (that’s what Year of Yes was) with a grain of salt, because after all it is made for the masses. The individuation that we as human beings have access to is what creates the recipe towards what will nourish and fulfill us. It’s rare to find the answers to problems or the guidance towards self actualization from an inanimate object. Read for the pure joy of it. Oh and Happy New Year!